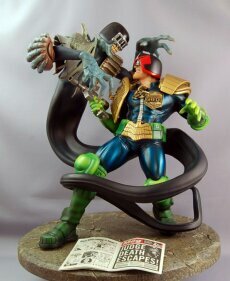 First 4 Figures and Rebellion are proud to present the first in a new range of 2000 AD statues – Dredd Versus Death, based on a poster image illustrated by Greg Staples. The fully hand-painted statue is minutely detailed, stands 11.5" tall and comes securely packaged in deluxe, full-colour packaging, including a Certificate of Authenticity. 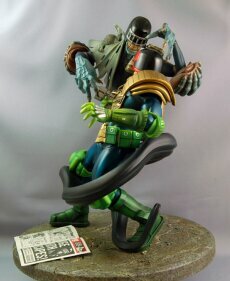 It is strictly limited to 1,000 numbered statues for worldwide distribution. 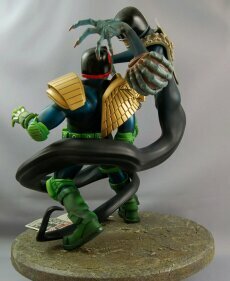 The 2000 AD online shop (www.2000adshop.com) will be selling a limited number of exclusive versions of the statue, which features a signed certificate from Greg Staples himself! Registered users of the 2000adonline site can get 20% off the £149.99 retail price by clicking on the link below and ordering the statue between now and September 30 th 2007. 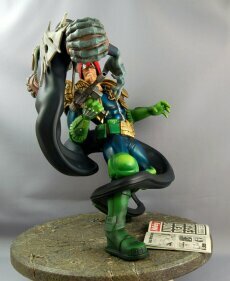 The Dredd Versus Death statues will be available from December 2007.